Temujin was born in either 1162 or 1155 in what is now northern Mongolia. He was the third son of his father, Yesugei, who was the leader of the Kiyad tribe. The Kiyad tribe, like many others on the Mongolian plains, were nomads, surviving by raising horses. When Temujin was nine, his parents put him into an arranged marriage and Temujin's father delivered him to the Oniggirat tribe, where his wife-to-be lived. On the way back from delivering Temujin, Yesugei was captured by Tatars and died. Upon hearing the news, Temujin returned to his tribe to claim his position as leader, but the tribe refused to let the young boy rule, so Temujin, his mother, and his siblings were all abandoned by the tribe. Temujin and his family lived in poverty, living off of wild fruit and small game that Temujin and his brothers hunted. In 1177, Temujin was captured and enslaved by the Tayichi'ud tribe, though with the help of a gaurd, Temujin was able to escape. Temujin led his family through the area, gaining followers as he went. Two of the most important allies that Temujin gained were Jelme and Bo'orchu, who would become major generals during Temujin's regin. Temujin returned to the Oniggirat tribe, where he married the woman his was engaged to, named Borte. The two had four sons, and Borte remained as Temujin's only wife throughout his entire life. Temujin realized that to gain power, he must make alliances, so as the tribes of the Central Asian plateau began to form confederacies, Temujin offered his tribes aid to Toghryl, the leader, or Khan, of the Kerait tribe. Temujin rose in power through both skill in battle and by eliminating political opponents. Temujin was so set on gaining power that he even killed his childhood friend, Jamukha, in order to rise. By 1206, Temujin was the the Khan of all of Mongol plains, save the Naimans. The defeat of the Naimans by Temujin left Temujin as the sole ruler of a united Mongol nation. Temujin was given the name Genghis Khan, which meant ruler from one ocean to the next. In 1206, Genghis Khan began to expand his new kingdom, and during this time of expansion, Genghis Khan's army would become the most powerful and the most feared army the world had ever seen. Genghis Khan began his conquests by attacking China, which was currently in three parts. By 1215, the great Khan had conquered the entire Western Xia Dynasty and had broken through the Great Wall of China and taken the Jin Dynasty as well. For the moment, the southern Song Dynasty was left alone, though it would eventually be conquered by Kublai Khan, the grandson of Genghis. From there, Genghis Khan moved west. Genghis would give each nation he encountered a choice. If the nation surrendered, he would add the nation to his ever-growing empire, but spare their lives. If the nation refused, Genghis would take them by force and raise their cities to the ground. By the time of his death, Genghis had taken all of central Asia, the Middle East, parts of Africa, and had even conquered eastern Europe and Russia. Genghis Khan had created the largest empire that there had ever been. To this day, no nation or empire has ever matched the size of the Mongol Empire. Genghis Khan also successfully conquered Moscow and the rest of Russia, a feat that both Napoleon and Hitler were unable to accomplish. 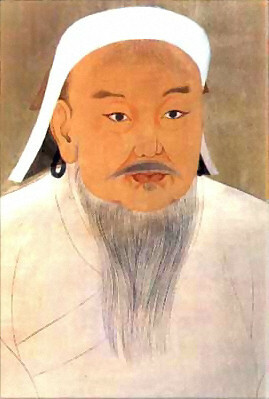 Genghis Khan was able to run his military machine by sparing farmland as he conquered. He would allow farmers to continue to farm if the gave some of their crops to the army. Genghis also allowed freedom of religion for those within his empire, and conditions, in many places, improved while under the protection of the Mongols. On August 18th, 1227, Genghis Khan died after falling off the back of his horse while in Egypt. The Great Khan's body was returned to Mongolia, and any living creature that crossed paths with the funeral procession was killed. Genghis Khan was buried somewhere in Mongolia, though his burial site was unmarked, and the exact whereabouts of the tomb remain unknown. Genghis Khan is on our list because he created the largest and fastest growing empire the world had ever seen and marks of his conquest can be seen all throughout the world.